WASHINGTON (JTA) — An array of Jewish groups and lawmakers attacked as immoral President Donald Trump’s decision to end an Obama-era program granting protections to illegal immigrants who arrived in the United States as children. The Trump administration said Monday that it would end the Deferred Action for Childhood Arrivals, or DACA, program in six months. President Barack Obama had launched DACA in 2011 after multiple attempts failed in Congress to pass an immigration bill that would settle the status of 11 million undocumented immigrants. The program protected those who arrived as children from deportation and granted them limited legal status. In statements, Trump and Attorney General Jeff Sessions said the principal objection to Obama’s so-called Dreamers program was that it was unconstitutional because it was established by an executive order, and indicated that Trump was ready to sign any congressional legislation that would accommodate the “dreamers.” It was unclear what would happen in the meantime or, should Congress not pass legislation, what would happen to the 800,000 people who have sought and received DACA’s protections. “The attorney general of the United States, the attorneys general of many states and virtually all other top legal experts have advised that the program is unlawful and unconstitutional and cannot be successfully defended in court,” he said. Republican leaders in Congress have expressed a willingness to pass the legislation necessary to protect the affected immigrants, but Jewish groups and lawmakers said ending the program presented immoral perils, given the failures of Congress in the past to agree on comprehensive immigration reform. Richard Foltin, the American Jewish Committee’s director of government affairs, called the decision “devastating,” and the Anti-Defamation League said it was one of “a long list of actions and policies by this administration that have deeply hurt immigrants and their families.” The ADL noted the pardoning last month of Joe Arpaio, a former Arizona sheriff who had been convicted of discriminatory practices against Hispanics, and the threat to withdraw funding from cities offering sanctuary to illegal immigrants. Other Jewish organizations condemning the decision included Bend the Arc, J Street, the National Council of Jewish Women, T’ruah: The Rabbinic Call for Human Rights, the Shalom Center and the Anne Frank Center for Mutual Respect. Bend the Arc listed rallies across the country it would join to oppose the decision. Jewish Democrats also slammed the decision. 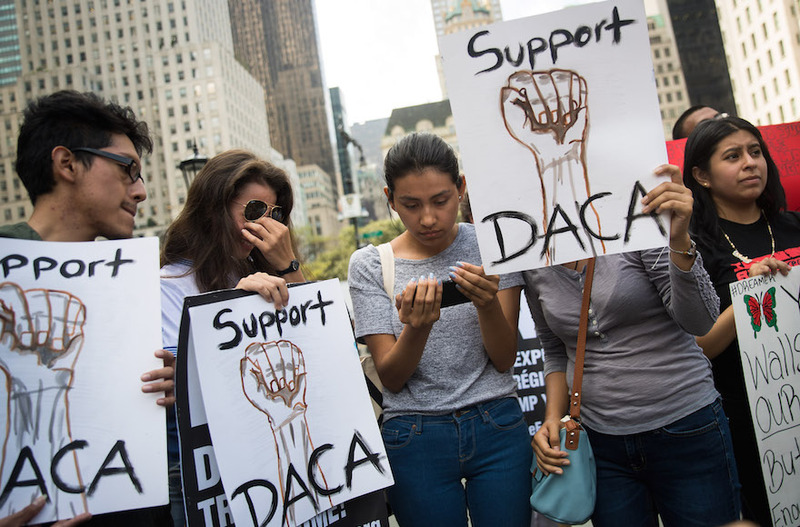 “Terminating #DACA now puts 800,000 talented young #DREAMers who love, contribute to, and live in America officially at risk of deportation,” Rep. Eliot Engel, the top Democrat on the U.S. House of Representatives Foreign Affairs Committee, said on Twitter. Terminating #DACA now puts 800,000 talented young #DREAMers who love, contribute to, and live in America officially at risk of deportation. Rep. Lee Zeldin, R-N.Y., one of two Jewish Republicans in Congress, in a long and anguished statement said he supported Trump’s decision but added that he would work to pass legislation to protect the undocumented immigrants.